At about 30,000 feet, something went terribly wrong with the left engine on Southwest Airlines Flight 1380 from New York to Dallas. The engine failure sent metal parts flying into the plane's fuselage and blew out a passenger window, killing Jennifer Riordan, a married mother of two from New Mexico. The Boeing 737 with 149 people aboard made an emergency landing in Philadelphia as terrified passengers wore oxygen masks. One of those passengers, Marty Martinez, joined CBSN over the phone to describe the harrowing account of happened just a few seats away from him. "The engine exploded and when it exploded it broke a window in row 17," Martinez said. "That window caused all the oxygen to go out ... a woman was injured ... there was blood everywhere." He told CBSN that people were trying to help the woman as another tried to plug the broken window unsuccessfully. He described the woman as being older and she was taken off the plane once it landed. 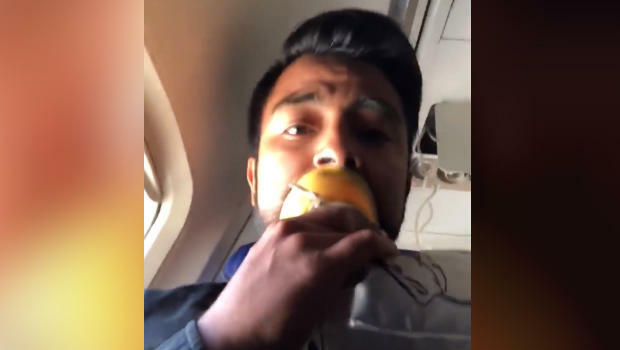 He said that there was Wi-Fi on the plane so he was able to stream a Facebook video that showed him wearing an oxygen mask as the plane descended into Philly. "I thought I was cataloging the last moments of my existence," Martinez said. "First there was an explosion, and then almost immediately the oxygen masks come down and ... the engine exploded then hit the window and busted it right open," Martinez said. "It felt like the plane was freefalling ... of course everyone is like freaking out, everybody is crying. It was the scariest experience." He added: "To see all the flight attendants crying, we knew it was something bad. Meanwhile I was on Facebook Live cranking out as many comments as I could thinking that was going to be the last few moments on this Earth." "All I could think about was family and my friends, my girlfriend, my brother, my sisters, my mom ... it was terrifying," Martinez said. After the plane landed, he posted photos of the broken window and damaged engine. "Everybody was crying and upset," fellow passenger Amanda Bourman of New York told The Associated Press. "You had a few passengers that were very strong, and they kept yelling to people, you know, 'It's OK! We're going to do this!'" "I just remember holding my husband's hand, and we just prayed and prayed and prayed," Bourman said. "And the thoughts that were going through my head of course were about my daughters, just wanting to see them again and give them a big hug so they wouldn't grow up without parents." The flight was powered by CFM56-7B engines. An official told CBS News that CFM International has sent representatives to the scene to support the investigation. The NTSB said Tuesday night that a preliminary examination found evidence of metal fatigue where an engine blade separated from the engine. Southwest announced that it is accelerating its inspections of CFM56 engines "out of an abundance of caution."